This just came into my inbox and it sounds very tasty to me! Check your calendar and hope see you there! "Wagashi, or traditional Japanese confections have been enjoyed throughout history in Japan. 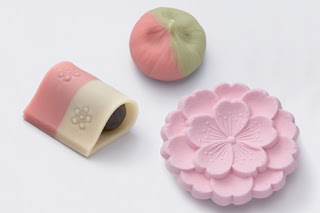 Though typically made out of bean paste, sugar and rice, wagashi are crafted in a wide variety of shapes and colors, with seasonality regarded as extremely important. Keiko Nakayama, archivist of Toraya Confectionary Archive, introduces the delectable history and vibrant seasonal traditions of wagashi. The program includes a demonstration by chefs from Toraya. Moderated by Julia Moskin, Reporter, Dining Section, The New York Times. Followed by a tasting reception. Part of Sakura — Spring Renews Beauty Blooms. Buy Tickets Online or call the Japan Society Box Office at (212) 715-1258, Mon. - Fri. 11 am - 6 pm, Weekends 11 am - 5 pm."